It’s that time of year when we all gather around the table with friends and family to celebrate Thanksgiving. Is your plumbing ready to handle the holiday? When you think about it, your plumbing system will undergo significant use like a freeway. 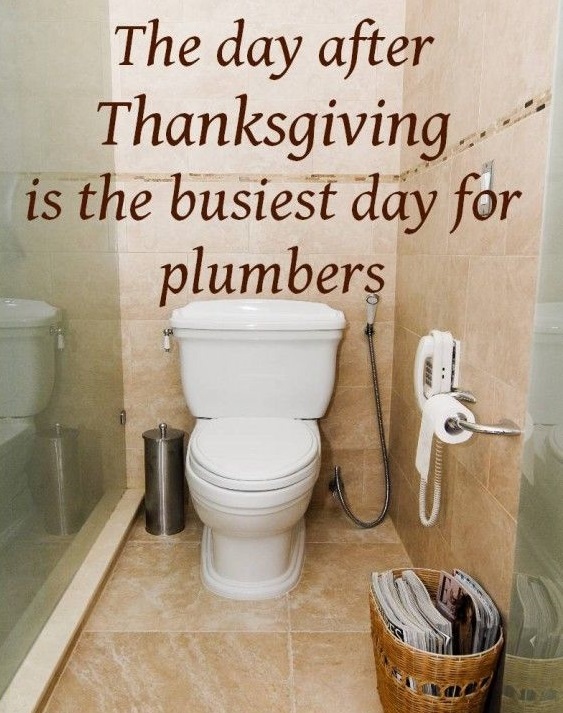 That’s why the day after Thanksgiving is the busiest day of the year for plumbers. At Rite Rate Heating & Cooling, we’re no strangers the many disasters that can happen to your plumbing system during the holidays. We’ve compiled a list of some tips to help you get through Thanksgiving! The only thing that should be flushed down the toilet is toilet paper. Make sure you leave a friendly reminder for your guests to put everything else in the trash. Keep the trash can nearby so that it’s easier to dispose of the unwanted trash. Another safety precaution is treating the toilet with a drain cleaning solution like Drain-O. This will help clear any simple clogs and break down any existing debris. If you’re having guests stay over then your shower is likely to get a lot of attention. In between shower times, make sure to clear the drain of any hair or gunk. The last thing you need is the bathtub or shower smelling from a clogged drain! Garbage disposals are lifesavers when it comes to the kitchen, but what happens when it breaks? Thanksgiving tends to be the time where everyone dumps all food scraps down the drain. Everything from turkey bones to grease is shoved down the garbage disposal, which is going to clog it. To avoid it getting backed up only put food debris in that can easily be broken up. It’s better to put the rest of the scraps in the trash than risking a plumbing emergency! If you do find yourself having a clogged drain or backed up plumbing, contact Rite Rate Heating & Cooling! We have plumbers on standby 24/7 during Thanksgiving and the weekend to offer emergency plumbing repair!